Patch-burn grazing is getting a lot of attention from a wide variety of audiences these days. The management system has generated substantial enthusiasm among some people – particularly those interested in improving habitat for prairie wildlife species. It has also generated substantial skepticism among others – particularly those concerned about potential negative impacts of grazing in eastern tallgrass prairies. To date, the majority of research on and demonstration of patch-burn grazing has been oriented toward influencing agricultural grassland management because of the system’s potential to improve wildlife habitat at those sites. Research has largely shown that farmers and ranchers can reap the habitat benefits of patch-burn grazing without compromising current stocking rates or livestock performance. Because wider adoption of patch-burn grazing techniques on private lands could have tremendous positive impacts on prairie wildlife populations, those research results are exciting, and the continuation of work toward that objective is very appropriate and important. However, the emphasis on developing and testing patch-burn grazing as an agricultural tool has also somewhat limited our ability to evaluate the system’s impacts (current and potential) on biological diversity. Variables such as stocking rates, timing and intensity of grazing, fire season and frequency, and others tend to be defined such that they are compatible with local grazing systems and cultures. Again, this is very appropriate, but it also narrows the range of possible modifications to the basic patch-burn grazing model that are being tested. 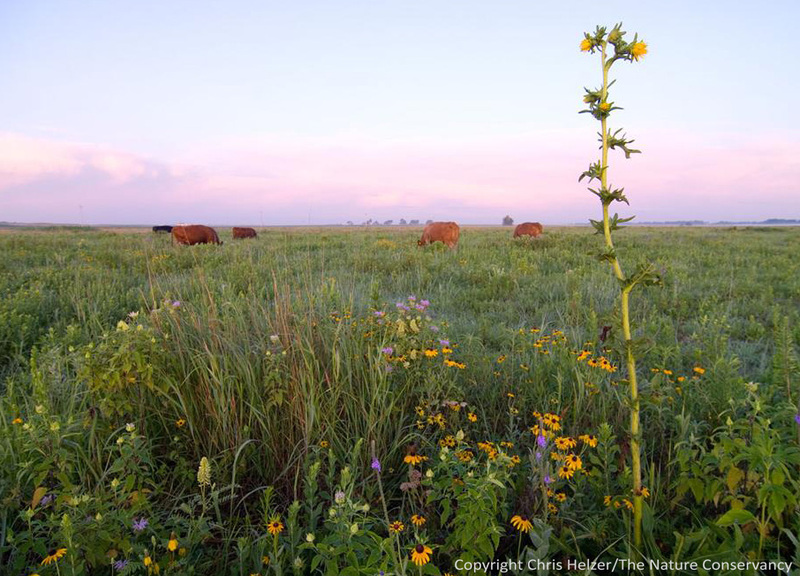 In contrast to research projects oriented toward balancing agricultural production with wildlife habitat, our work with patch-burn grazing in the Platte River Prairies of Nebraska is targeted only at building and sustaining biological diversity. Our stocking rates, fire frequency, and other variables are all primarily designed to favor plant diversity. Because few others are experimenting with patch-burn grazing from the same standpoint, we have tried to gather as much data as we can about the impacts of our various patch-burn grazing modifications – especially related to impacts on plant species and plant communities. We’re taking the approach that if we can learn how to optimize management for plant diversity and overall biological diversity, we can then help translate and modify those methods to fit the specific needs of private landowners, public land managers, and others. A burned patch in restored prairie along the Platte River in Nebraska. Cattle are concentrating their grazing in this area, but the light stocking rate employed means that while many grasses are being grazed, most forbs are not. In this case, ungrazed forbs include opportunistic plants such as black-eyed susan and hoary vervain, but also compass plant and Canada milkvetch, which are often viewed as negatively affected by cattle grazing. This week I attempted to capture what we’ve learned about patch-burn grazing to this point and incorporate it into a single document. We certainly don’t have all the answers, and the document should not be read as a prescription for precisely how to employ patch-burn grazing. Rather, it is a description of the kinds of things we’re trying on our sites and the results we’ve seen so far. I hope it will stimulate thought and discussion among other prairie managers looking for new ideas and options for dealing with prairie management challenges. As I’ve said before on this blog, patch-burn grazing is not an appropriate management system for all prairies. Moreover, patch-burn grazing often gets treated as a single narrow management system, but should really be seen as a basic template – and should rarely be implemented without tailoring it to meet particular objectives. This new document describes some of the modifications of that template being tested at our sites and the responses we’ve seen from the prairie communities we manage. If you’re interested, you can download the document here. This entry was posted in General, Prairie Management, Prairie Natural History, Prairie Plants, Prairie Restoration/Reconstruction and tagged biological diversity, birds, cattle in prairies, cows, farmers and ranchers, grassland, guide, missouri, nebraska, patch burning, patch-burn grazing, plant diversity, platte river, prairie, prescribed fire, wildflowers, wildlife habitat by Chris Helzer. Bookmark the permalink.